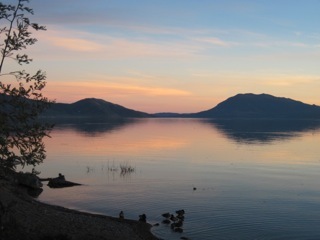 Clear Lake, north of San Francisco Bay, is California's oldest lake and a potential treasure trove for climate scientists. A radio version of this story aired on The California Report. Clear Lake is one of the largest lakes in the state, and one of the oldest in North America. For half a million years or more, pollen and dead bugs have been collecting on the bottom. That gives scientists a unique opportunity to look deep into California’s past to learn what’s grown here through ice ages and warmer “interglacial” periods. Dr. Cindy Looy, an assistant professor in Berkeley’s Department of Integrative Biology, is leading a project to core Clear Lake, unearthing sediment that’s been collecting on the lake bed for up to 200,000 years. Looy is especially interested in the interglacials, times between ice ages, when the climate was warmer. We’re in one now — it began about 12,000 years ago — but Looy is prospecting in the one that began about 130,000 years ago, when the earth might have been warmer than it is now. Video produced by Harry Gregory. Looy is looking for pollen in the cores, to learn what plants grew around Clear Lake when the climate was warmer, and how the plant life changed as the climate did. Then she’ll compare that data to models other scientists have made that attempt to paint a picture of California’s future landscape. To extract the cores, Looy and her team are working on a barge that looks — and sounds — like a construction site that sprouted in the middle of the lake. In fact, they rented the barge from a local construction company. DOSECC, a company that specializes in scientific drilling (the name stands for Drilling, Observation and Sampling of the Earth’s Continental Crust), supplied the drill and the drillers — the drill they’re using would normally be used for mining for precious metals. As DOSECC’s drillers pull the cores up from the lake bed, they hand them off to UC Berkeley grad students, who work with scientists from LacCore, a group that works exclusively on lake cores. The students cut the ten-foot cores into more manageable segments, then seal and label them. The cores will eventually go to LacCore’s facilities at the University of Minnesota, where half of each one will be stored permanently, in a library of lake bed cores from all over the world. Looy will slice up and analyze the other half, counting and identifying miniscule pollen grains, documenting what it looked like around Clear Lake through the ages. And that will help us imagine what the landscape around Clear Lake will look like in the future. Looy’s Clear Lake coring project is part of the Berkeley Initiative in Global Change Biology, a program focused on cutting edge, cross-disciplinary climate change research. I just discovered Clear Lake a year ago and spent several months there. It use to be a prime destination place and has become economically desolate. There is a serious lack of environmental protections and enforcement except for the mussel population. As a result the blue green algea blooms there in the heat of the summer has driven people away. Self interested land owners and unethical business people are making a muck of this absolutely beautiful lake. It could be paradise is we will just let it. You may be unaware but rivers and lakes today all over the US are experiencing serious impacts from society as a whole. My boyhood home in Woodbridge, VA. has taken an ugly turn over the past decade, but in the 60’s it always suffered with algae blooms in the summer. I believe the biggest polluter to Clear Lake is the government, with it’s failures to either regulate or restrict historical dumping of toxic waste and more recently poorly treated sewage. I applaud your sentiment to conserve a wonderful landmark. For those who live on the lake I like the idea that the best medicine may be to keep it “economically desolate”. I live a half mile from Clear Lake and camped at Clear Lake State Park in the 60s. There was heavy algae then. The lake is old, shallow, and fairly warm, and the algae is natural. We are trying hard to keep nutrients out of the lake. Part of the problem is that the tules have been removed from lakeside. And the illegal pot grows are a major source of excessive nutrients flowing into the lake. To say that environmental protections are lax is not a fact. We have many local organizations and people working to keep the lake healthy including the Lake County Land Trust and the Sierra Club. The county has taken an active roll too. We have a super-fund site, but the federal, state, and local governments have been working for many years to correct the problems from the old mine. Some of the reclaimed land at the north of the lake will be returned to wetlands and the trust is trying to preserve wetlands and tules in the Big Valley area. These are both critical projects to preserve the lake and prevent excessive nutrients washing into it..